It must come as a relief to EU politicians to find that there is still one group in society which is much less popular than they are: the bankers. Indeed, bankers’ unpopularity has only grown as the austerity caused by the global financial crisis has an ever-greater impact on ordinary people in many Member States. No politician ever lost an election because he or she demonised unpopular groups of persons, and so the EU institutions have duly agreed on legislation which would lead to jail terms for particular types of bad behaviour by bankers. The new Directive was approved by the European Parliament today, and will likely be formally adopted by the Council in March. It will apply in parallel alongside a Regulation on market abuse, which requires administrative sanctions to be applied for certain behaviour by bankers. Member States will have to apply the Directive by two years after its adoption. The ‘legal base’ for the Directive is Article 83(2) of the TFEU, which allows the EU to adopt legislation setting out ‘minimum rules’ for the ‘definition of criminal offences and sanctions’ if this ‘proves essential to ensure the effective implementation of a Union policy in an area which has been subject to harmonisation measures’. Clearly this area has been subject to harmonisation measures, and the preamble to the new Directive sets out the reasons why, in the EU legislature’s view, it was ‘essential’ to adopt an EU measure concerning criminal liability on this issue. Basically, the Council and European Parliament were convinced by information that Member States imposed weak and diverse sanctions to enforce the previous EU legislation on this subject (Directive 2003/6, on market abuse). Article 83(2) requires the criminal law rules to be adopted by the same legislative method as was used to adopt the main legislation that the criminal law Directive is supplementing. In this case, the market abuse Regulation was adopted on the basis of the EU’s internal market powers, ie the ordinary legislative procedure. So the market abuse criminal law Directive was adopted by the same method. This meant that the European Parliament could have a significant influence on the text, as detailed below. The Directive requires Member States to criminalise three types of activity, as further defined in detail therein: insider dealing; unlawful disclosure of inside information; and market manipulation. The first of these offences also extends to recommending or inducing another person to engage in insider trading. Member States must also criminalise inciting, aiding and abetting and attempting most of these offences. In each case criminalisation is only required where the acts were committed intentionally and ‘in serious cases’. The European Parliament had also wanted to oblige Member States to criminalise reckless acts which entailed market manipulation, but the Council resisted this. Also, the Council insisted on limiting Member States’ obligations to ‘serious cases’. The preamble to the Directive lists certain factors which should indicate whether the case is ‘serious’, such as the impact on market integrity and the profit derived or loss avoided. On the other hand, the European Parliament successfully insisted that specific rules for criminal penalties for natural persons appear in the Directive. Member States must ensure that bankers guilty of insider dealing or market manipulation could potentially be subject to a maximum penalty of at least four years, and those guilty of unlawful disclosure of inside information could potentially be subject to a maximum penalty of at least two years. The Directive also includes standard rules on liability for legal persons, but this need not be criminal liability, in deference to those Member States which do not impose criminal liability on legal persons. The European Parliament also insisted that the Directive include rules on criminal jurisdiction. Member States must criminalise the relevant behaviour where an act was committed on a Member State’s territory, or where the act was committed by a Member State’s citizen outside its territory, at least if the act was criminal in the country where it was committed. Furthermore, the European Parliament convinced the Council to add a provision on training judges, prosecutors et al about the relevant crimes. However, the European Parliament did not convince the Council to add provisions on investigative techniques and media coverage of the relevant crimes. This is the first time that the EU has used the legal powers conferred by Article 83(2) TFEU, which was added to the Treaties by the Treaty of Lisbon. Previously, it has used only Article 83(1) TFEU as regards substantive criminal law. Article 83(1), also added to the Treaties by the Treaty of Lisbon, lists ten crimes which are deemed to have such sufficient cross-border impact that the EU can legislate upon them. The EU has used this power to adopt legislation on cyber-crime, sexual offences against children and trafficking in persons, and negotiations on legislation concerning counterfeiting currency are underway. The Commission has also suggested criminal law rules on fraud against the EU budget on the basis of Article 325, a legal base dealing with that specific issue, but the Council (and probably the European Parliament, when it defines its position) believe that Article 83(2) will again have to be used in order to adopt that legislation. Prior to the Treaty of Lisbon, the EU’s Court of Justice, in a controversial line of case law, ruled that European Community law (as it was then) could be used to adopt criminal law measures closely related to the environment (Cases C-176/03 and C-440/05). The EU then adopted Directives to that end (Directive 2008/99 and Directive 2009/123), as well as a Directive imposing criminal liability for employing illegal immigrants (Directive 2009/52). But the CJEU ruled that prior to the Treaty of Lisbon, such European Community measures could not specify criminal penalties. In practice, those measures did not contain jurisdiction rules either. So the market abuse Directive breaks new ground on these issues. The Directive also breaks new ground by imposing criminal liability in a new area. All of the other post-Lisbon substantive criminal law Directives or proposals (referred to above) simply replace pre-Lisbon measures on the same subjects, but there was no pre-Lisbon measure imposing criminal liability for market abuse. The market abuse Directive is also particularly detailed when compared to the EU’s other substantive criminal law measures, no doubt because it is enmeshed within the broader EU legislative framework imposing highly detailed regulation on the financial sector. 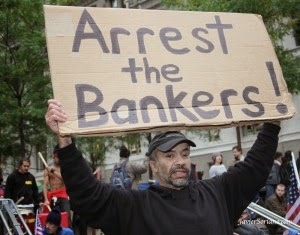 Will the Directive be effective at curbing bad behaviour by bankers? First of all, as with any crime, perpetrators have to be caught and punished, and the behaviour concerned is technically complex. Secondly, it must be borne in mind that the two-year and four-year sentences referred to in the Directive must merely be on the books; there is no obligation to impose them in any particular situation. So even if bankers commit the activities criminalised by the Directive, and are caught and convicted, their sentences might be lighter (or indeed heavier: Member States can set a higher potential maximum penalty if they wish). And it is hard to imagine that many bankers will spend much jail time inside the unpleasant institutions where (say) burglars and muggers are incarcerated – even if the bankers’ crimes were far more lucrative and had a much bigger impact upon the economy. More profoundly, the United Kingdom, the home of the largest proportion of the EU’s financial industry, has opted out of this Directive – although the UK is subject to the parallel Regulation (Denmark is in the same situation). And even if a French national (for instance) commits the acts criminalised by the Directive while working in the City of London, it must be recalled that Member States are only obliged to criminalise the acts concerned if committed by their citizens in a State which also criminalises that activity. So it is up to the UK to decide whether to criminalise some or all of the acts referred to in the Directive, and only if it does so are other Member States obliged to criminalise the acts of their citizens when committed in the UK.